George W. Bush's newest television ad shows scenes from the Olympics along with flags from Iraq and Afghanistan. The narrator mentions them as two new free nations competing. So far, so good for Bush. How quickly things can change. 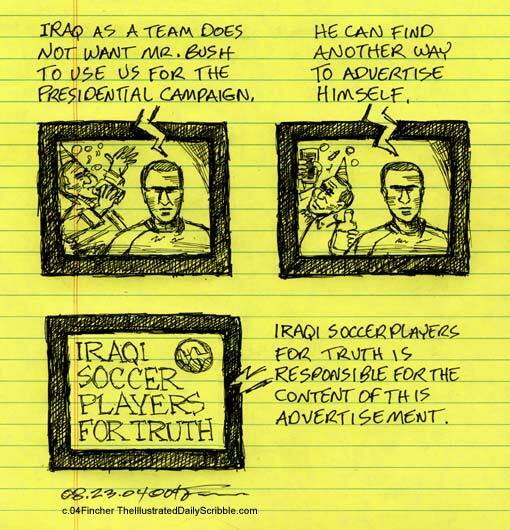 Members of the Iraqi soccer team objected to being used by Bush. The words in the above Scribble were actually spoken by Iraqi team member Salih Sadir. It gets worse. Another player asks how Bush can face his god given all the people he's killed. Coach Adnan Hamad talks about how much has been destroyed in Iraq and the hatred for America. See the Sports Illustrated article by Grant Wahl to see these other quotes about how Bush has made people hate America and the full story.